Who is this 1838 GWR shareholder? Can anyone help? Who spent £1000 on GWR shares in 1838 and logged it here? This was sent to me today by antiquarian book dealer, Patrick Pollack. 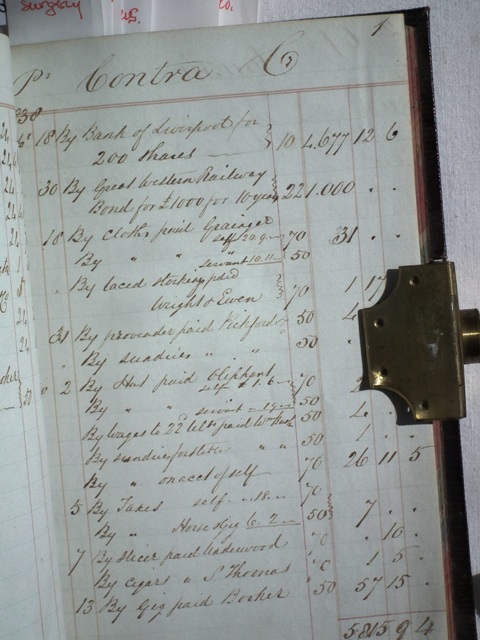 It shows an entry in an anonymous cash-book for 1838 where the owner has bought shares in the GWR! So, who could it be? It must be someone with considerable wealth and, of course, this was the year the GWR opened so it is one of those men of vision in those heady days of railway innovation when Brunel was at the height of his powers. Patrick wondered where records of GWR shareholders are now archived and I have to admit I do not know. The main contenders must be the NRM, Didcot, the National Records at Kew or maybe somewhere like the Institute of Directors. All we know is that this is a person of some significant wealth and that he lived in Devon. Maybe you can help solve this interesting snippet of GWR history? Good Luck with your search, I am sure you will find out what you want at the above.